Aristide’s return, some photos and video, to mark the event plus excerpts on Artistide’s eviction from Haiti by Jamaica’s fiercest columnist the late John Maxwell. (twice) Britain and Spain, to establish its independence and to abolish plantation slavery. This was unforgivable. 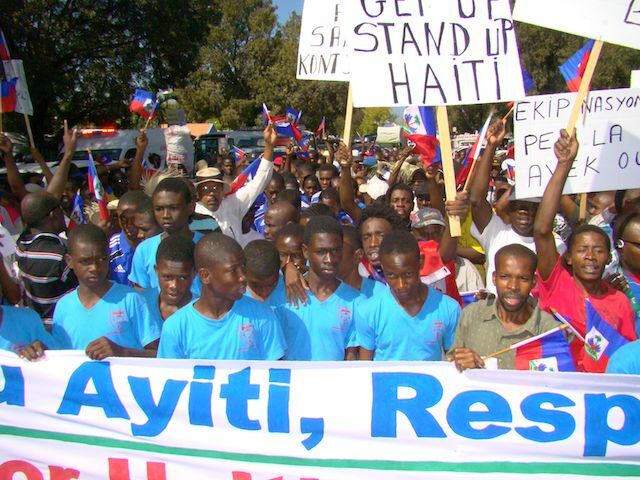 • Despite being bombed, strafed and occupied by the United States early in the past century, and despite the American endowment of a tyrannical and brutal Haitian army designed to keep the natives in their place, the Haitians insisted on re-establishing their independence. Having overthrown the Duvaliers and their successors, the Haitians proceeded to elect as president a little black parish priest who had become their hero by defying the forces of evil and tyranny. • Aristide threatened the hegemony of a largely expatriate ruling class of so-called ‘elites’ whose American connections allowed them to continue the parasitic exploitation and economic strip mining of Haiti following the American occupation. • Haiti would make a superb base from which to attack Cuba. 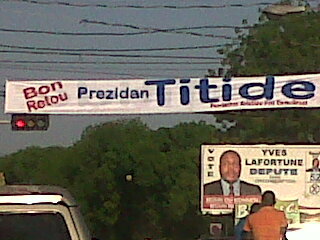 The Haitians clearly did not know their place. In February 2004, Mr John McCain’s International Republican Institute, assisted by Secretary of State Colin Powell, USAID and the CIA, kidnapped Aristide and his wife and transported them to the Central African Republic as ‘cargo’ in a plane normally used to ‘render’ terrorists for torture outsourced by the US to Egypt, Morocco and Uzbekistan. 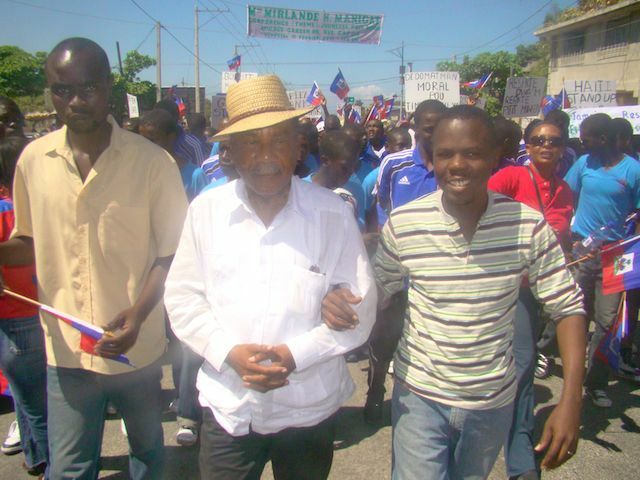 For all who refused to believe til they saw photos of #Aristide on the plane en route to #Haiti. 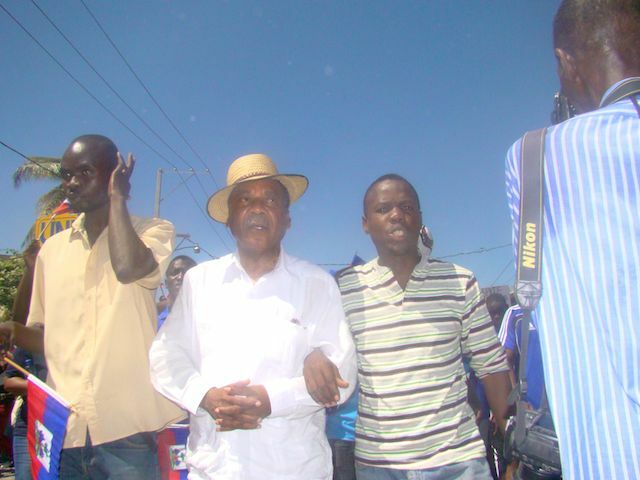 Danny Glover, the well-known American actor flew all the way to South Africa to accompany Aristide back to Haiti. Apparently the two have been close friends for many years. There is also another view of Aristide well articulated by Alex Dupuy. Read it to get a more complete picture of this unusual leader. 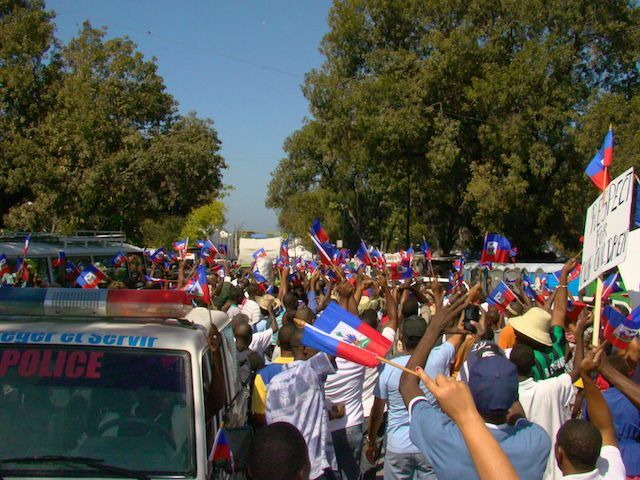 Author apPosted on March 18, 2011 March 18, 2011 Categories Aristide, Haiti, John Maxwell, UncategorizedTags Aristide's return, Haiti, John Maxwell1 Comment on Bon Retou Prezidan Aristide! Did Haiti Need this Blow, Jamaica? 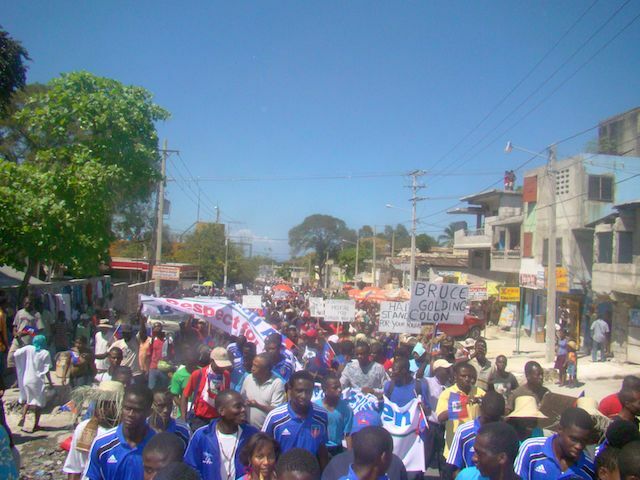 A look at the protest march held in Haiti on February 18 against Jamaican treatment of their Under-17 football team and responses in Jamaica to the Haitian outrage. 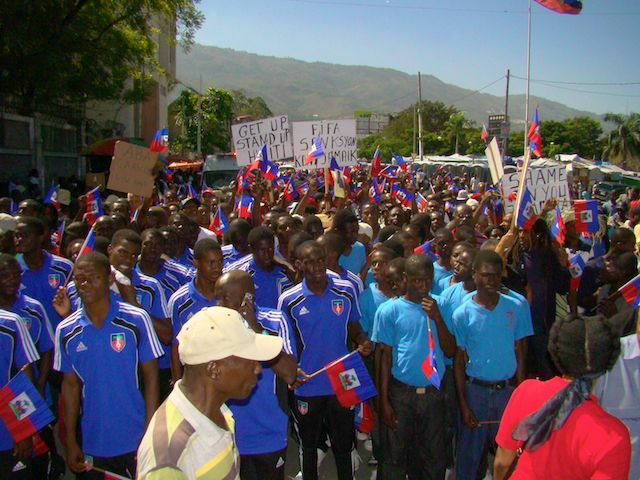 The photos below are from the protest march held in Haiti on February 18 against Jamaican treatment of their Under-17 football team. Poor John Maxwell must be turning in his grave. Jamaican officials, showing uncommon concern for the nation’s health saw it fit to send back the Haitian Under-17 football team which had come here to participate in the CONCACAF tournament. According to an Observer source, fears about a potential cholera outbreak escalated after several of the Haitian players, who arrived in Jamaica earlier this month to compete in the tournament, fell ill. Others had symptoms including fever and headaches. Eight of the players were tested and three were found to have malaria. They were slated to be admitted at the Cornwall Regional Hospital, but there were no beds there, the source said. As a precautionary measure, the team was to be quarantined. But after a day of waiting inside the hospital’s emergency ward, the Haitian coach got angry, left the hospital, and returned to the hotel at which the team was staying, the Observer was told. He was later allegedly handcuffed and forcefully removed from the hotel by representatives from the Ministry of Health, who had quarantined the sick players at the Falmouth hospital between Tuesday night and Wednesday morning last week. The situation wasn’t helped by language problems and the different responses to malaria in each country. It’s a fact that in Jamaica anyone with malaria is immediately quarantined and in general the health authorities are quite punctilious about keeping the nation free from contagion of various sorts. I remember being astonished once years ago when i had just returned from India to receive a visit from a health official who came to my home to ensure that i wasn’t suffering from any illness i might have brought back with me. I did feel slightly insulted but then decided to look on it as a good thing–one small corner of the governance structure that actually works. 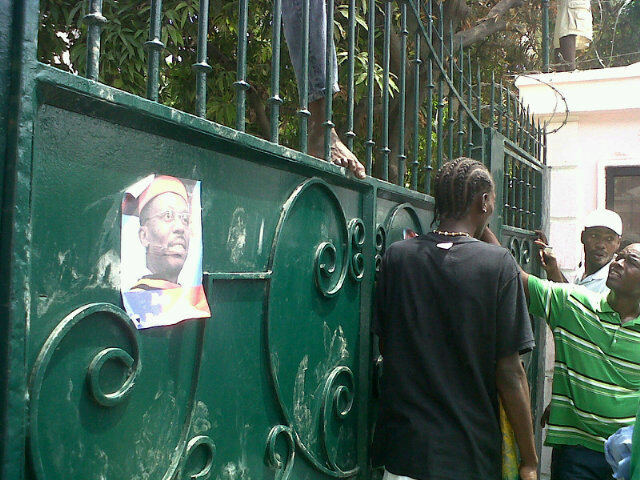 Even so i feel that the Jamaican reaction erred on the side of insensitivity. I was alerted to this situation three days ago when an irate friend in Haiti contacted me. 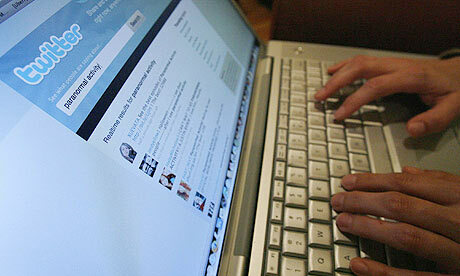 At the time there was hardly anything in the media about it and I myself wasn’t fully pripsed on the situation. I asked him if the events were recieving a lot of attention in Haiti. “Attention? We are very pissed off,” came the annoyed reply. Incidentally the Haitian team coach is Brazilian. I heard him on RJR a little while ago describing the extremely long waits at the hospital and a clinic, we’re talking about hours, five or six hours, without treatment or explanation.He himself was one of the three sick members of the team and returned to Haiti with a very high fever and profoundly upset. I would have thought that even if Jamaicans feel that they’re in the right they’d have shown more interest in trying to find out what had caused the Haitians so much offence instead of simply shrugging and saying “Better safe than sorry.” The Haitians are clearly hurt and humiliated. They may be overreacting too, just as the health officials seem to have done. I was surprised at how little attention the Jamaican media paid to this situation over the weekend. 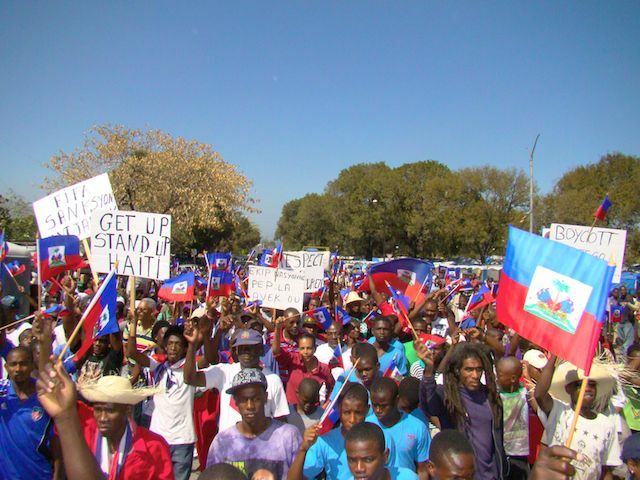 It wasn’t until the Haitians really made a big issue out of it that the media, today, started focusing on it. It’s an extremely vexed situation. 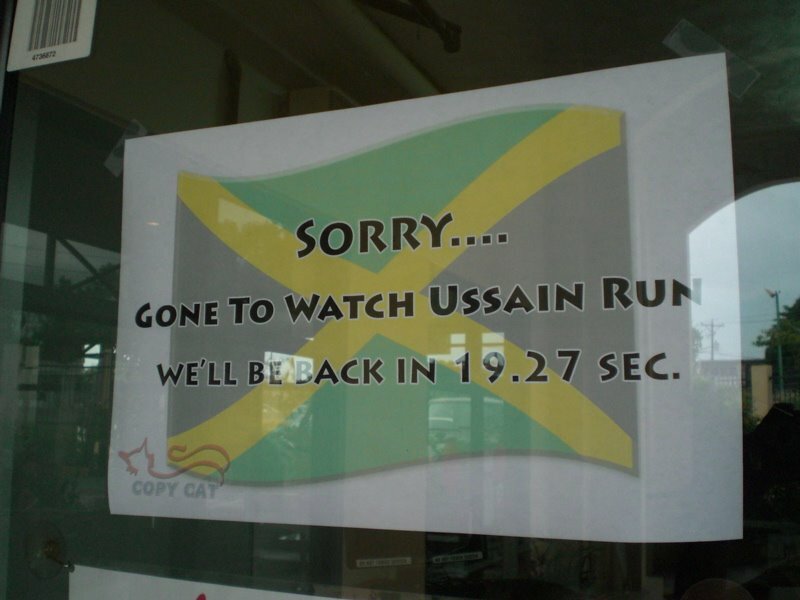 Jamaica has the upper hand. Does it cost so much to apologize and try to mend fences? 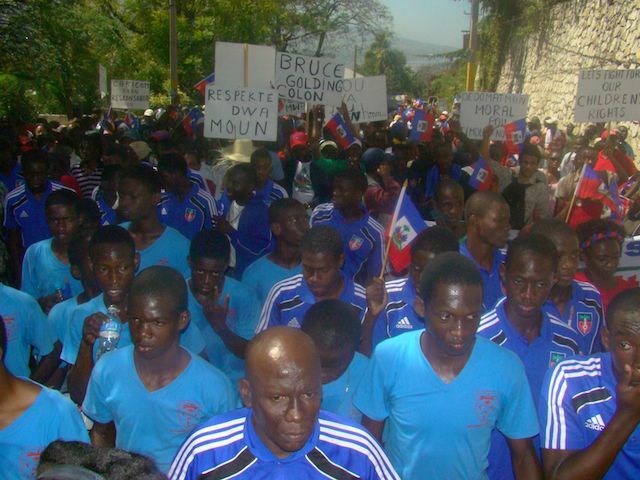 Author apPosted on February 21, 2011 February 21, 2011 Categories Haiti, Jamaica, UncategorizedTags CONCACAF, Football, Haiti, Jamaica, malaria13 Comments on Did Haiti Need this Blow, Jamaica? 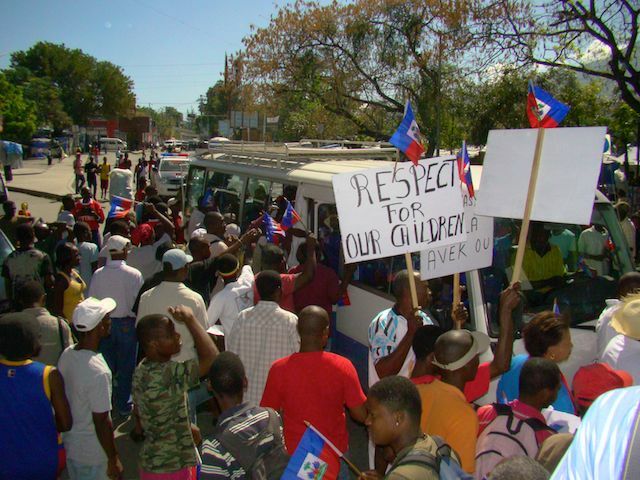 Haiti at 6 months|Managing expectations by not naming them? 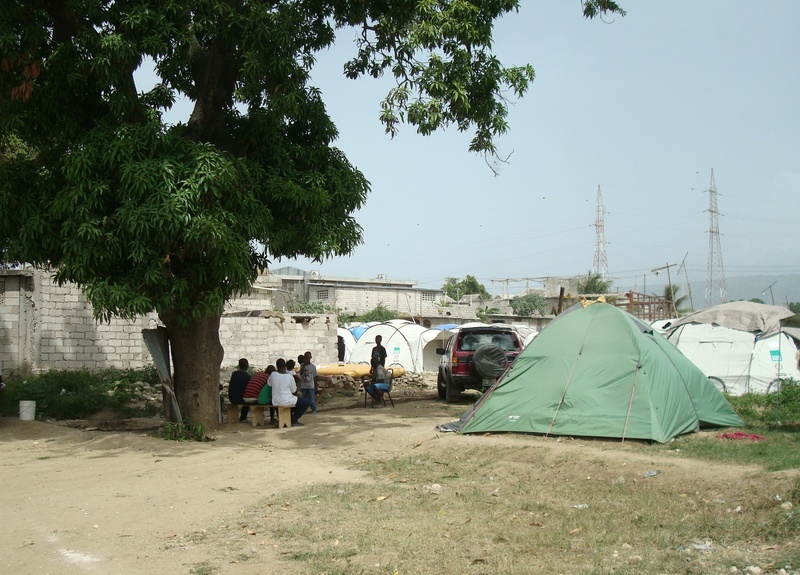 A tree is a rare sight at a camp and here, in Tabarre, residents use the shade for community meetings. When I nearly fainted in the second camp we visited in Tabarre this Monday, some of the women leaders who live there brought me a Tampico juice right quick. It was sweating, ice cold. How do they get ice? And where do they keep it? Then I thought, Great. They’re running to bring me juice while the 250 families that live here get by on 500 gallons of water a day. That’s the same amount of water in a luxe hotel’s fish tank. One year ago, I spent an entire night dreaming that I was a giant fly. When I awoke, I was startled to discover that I was myself. I decided that this was a vision, and asked my Guruji (from Better Living through Conscious Snoring) what I should do with it. Guruji told me to stop depending on other people to tell me what to do, become an entrepreneur, and document my journey and daily achievements in a journal. The crowd went crazy for Ataklan on July 3, at the T&T launch of The Mix at Casa de Ibiza on Tragarete Road in Woodbrook. Ataklan has been coming to Jamaica frequently over the last year to record songs for his next album here. Identified as the “Trinidadian friend” in the photo below when it appeared in a Jamaican blogpost, Klan even penned a Dudus song called Kingston Town (“Man, so many of dead bodies, so few recovered guns…Tell me what a gwaan roun here, is there no love for life roun here…“) while here in June. 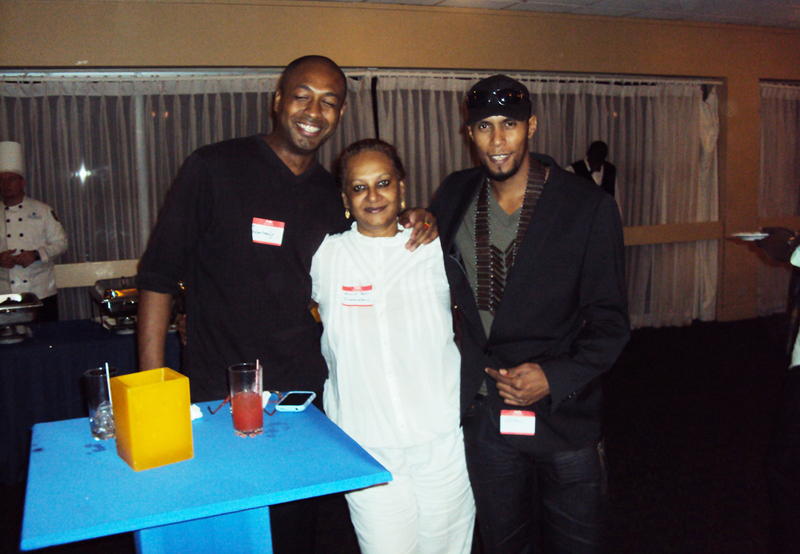 I’m indebted to Corve Dacosta who took the photo for his blogpost on the Jamaica Pegasus tweetup.